In 2012 I was part of what became one of the most pivotal moments in my Union’s history, and in the lives of NSW firefighters. It was a general strike of NSW firefighters which doesn’t happen often. The last time it occurred in NSW was 1956, and given the size of the fire service in NSW now compared to 1956, and compared to the size of the NSW fire services to the rest of the country, I am of the opinion that it effectively became the largest firefighter strike Australia has ever seen. I am yet to peer test that statement, and it’s hard (and perhaps unfair) to try and compare this to other important events in our Union’s history (like our long running and successful Death and Disability dispute) but it’s worth putting in perspective. Regardless, this story is intended to document some of the background of this event for the future, some of the many stories of that day, and to document its legacy. This is long, but it’s important to have this saved for the future. 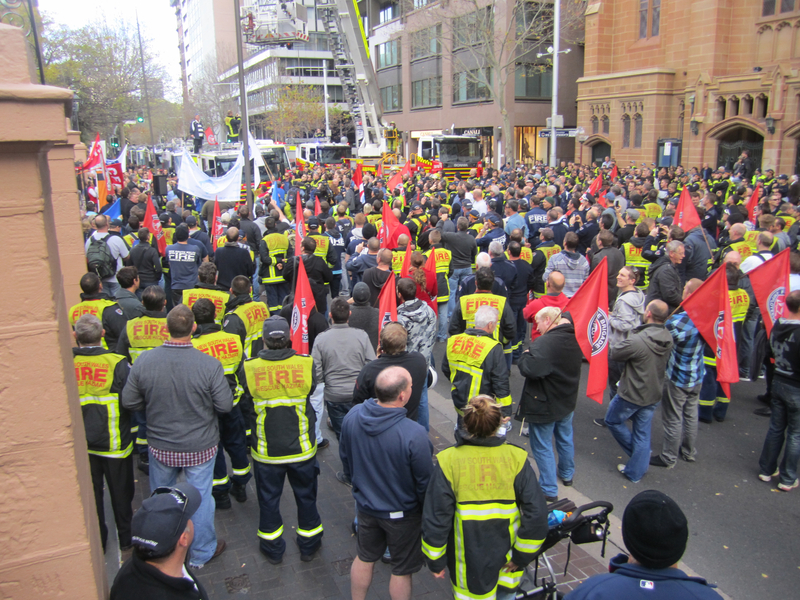 At the time of writing this piece (June 2013), it was exactly one year to the week since the strike, I was President of the NSW fire Brigade Employees’ Union (FBEU) and had been since 2009. One year after writing this (two years after the event) I posted this on my web site as a historical record. This was an event that continues to change the lives of firefighters and ambulance officers in NSW due to the actions of organised and unionised NSW firefighters that day, June 21, 2012. It was early 2012, and the newly installed NSW Liberal Government under Barry O’Farrell was twelve months into its new tenure and had started cuts across several key areas. It was clear to those of us watching closely that this was no simple restoration of balance to the state budget, it was a long awaited right wing assault on public service workers. The Liberal and National Partys (LNP) were on a crusade, following the same play book that other conservative states in Australia were following, a sustained razor attack on the public sector. If you think that is an exaggeration, look at the list: A ‘commission of audit’ set up to recommend everything they had always wanted to do, which became a forecast for what was to come. Budget cuts aimed squarely at the public sector including nurses, firefighters, and education. The selling of public assets, major assets which are some of the last assets the people of NSW have left. 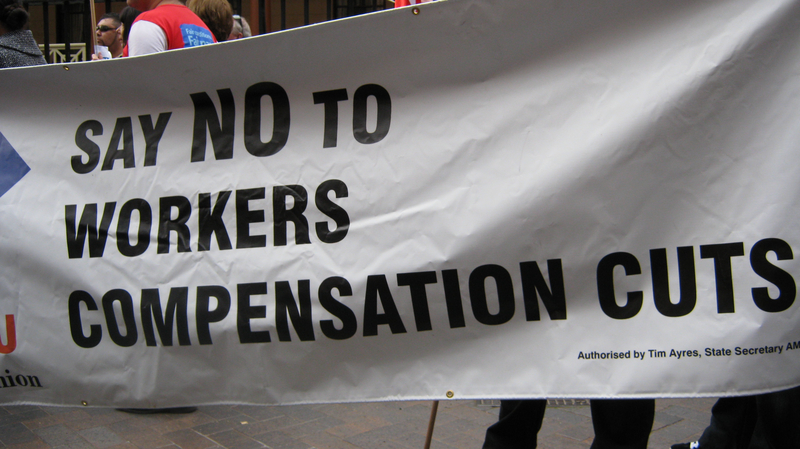 A new wages policy which limits wage increases and takes away any ability to claim work value. Concerned that the courts might uphold sanity, the Government took away the powers of the courts to rule on most of these matters, and to this day threaten to take away the NSW Industrial Relations Commission entirely. Unions once had the ability to take action and withdraw labour – not under this Government. The O’Farrell Government passed legislation to raise the fines 1000% for doing so, which will soon be law. Not content with that list, they proposed changes to NSW fire funding, which would see property rates rise and insurance payments too (as proven by the same system installed in other states). This is only a small snapshot of the assault on NSW workers – tens of thousands of them. All of this major reform, legislation, and law changes intended to cut the public service to the bone. The budget cuts have already caused the closure of fire stations and ambulance stations in NSW. We’ve seen hospitals and TAFE services reduced, and further cuts yet to come. Amongst all these cuts was one that triggered chaos for the NSW Government and the people of NSW – cuts to workers compensation. With the announcement of the cuts to workers compensation also came analysis from peak NSW Unions that these would have long lasting negative impacts on workers. The same analysis by my Union, the FBEU, showed that anomalies in the legislation between volunteer services like Royal Lifesaving, and indeed the volunteer fire service, NSW Rural Fire Service (RFS), meant that volunteers would have more workers compensation cover than full time professional firefighters working for Fire and Rescue NSW (FRNSW). This was dangerous, unfair, unworkable, unreasonable, and unsustainable. Nonetheless, the legislation was set for parliament, and the O’Farrell Government forged ahead with support on all of these cuts from the minor parties (Shooters and Fishers and the Christian Democrats) who had, up until this point, been rubber stamping the LNP cuts, with the Greens and the ALP outvoted on most occasions. The FBEU attended, supported, and spoke at all the major rallies and protests held in Sydney that year around these issues. We were front and centre in one of the largest of such protests, alongside forty thousand other public sector workers taking to Sydney streets and marching Parliament. The workers compensation rallies were well attended and the FBEU understood the need for unity across the board on this. The goal was to protect all NSW workers. As the day came for debate in the NSW Parliament, it was clear to us, that other Unions were not going to be able (or prepared) to mobilise en masse to change the legislation. So the FBEU State Committee of Management held several meetings in the weeks prior. The FBEU State Secretary Jim Casey, and I, had previously met with cross-benchers and key Ministers over this issue, and the budget cuts, to no avail. The laws were coming and we had to do something to protect the lives of our members, NSW firefighters and their families, into the future. June 20, 2012. The legislation was set for Parliament the next day, and the FBEU State Committee held a final crisis meeting. Serious and sustained strike action (and the fear of it) was the only option left. 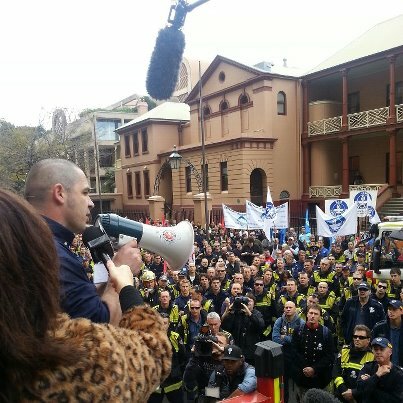 We resolved to call a special general meeting to consider a general strike the next day – the first for NSW firefighters in 56 years and something rarely, if ever, done by firefighter unions anywhere in the world. The media had been watching us closely for months after stop work action taken by our members during the budget cuts protests (one of the only unions to do so), and numerous references we’d made to strike action during media interviews on these matters to ensure they were primed should we need it. Nothing is glossier for media than firefighters in bright uniforms with big red trucks taking industrial action which can lead to serious consequences. It’s public relations gold when used correctly, but it’s a card we consciously and strategically don’t overplay. Nonetheless, with a strong and united FBEU State Committee and our industrial team laying out the battle plan, we made the decisions that would soon become history for the FBEU, for Unions more broadly in NSW, and for the NSW Government (if they ever admit it). June 21,2012 would be a line in the sand. The day was coming for NSW firefighters to take a stand under enormous pressure. The State Committee’s decision to hold three general meetings (Sydney, Newcastle, Wollongong) with a recommendation to be voted on by members to pull every permanent firefighter off the job in the Metropolitan area was released the night before. Soon after, a media release went out with State Secretary Jim Casey’s name, and mine as President, at the bottom. A dice was rolled that hadn’t been rolled for a long time, and the odds were well against us. Looking back, those communications started a snowball which grew and grew over the next 24hrs. Within minutes we were hearing that Premier had been notified, that other emergency services were being put on standby, and that consideration was being given to bringing the army into the Sydney CBD. Pressures were applied to us to immediately call the meetings off. From home with our families that night, the FBEU State committee continued to strategise with us and prepare the membership. Jim and I spoke hourly the night before until about 1am. We literally cooked dinner and did family chores, while organising a strike of Australian workers that threatened to bring the armed forces into the heart of Sydney. To say tension was high would be an understatement. Like most of our State Committee and staff, I was up early on June 21. I had to drive the regular 2 hrs up to our city office from home, and my phone starting ringing at 6am (it didn’t stop ringing until late that night). On arrival at the FBEU office, I was met by Comrade Casey with a handshake, and a brotherly hug. Such was the magnitude of the day. Such was the feeling between us on what we were about to undertake. “You ready for a big day?”, he asked. I was ready. We were both ready. From all over NSW, the FBEU State Committee began to congregate at the FBEU bunker, along with our industrial and office team. The same feeling of comradary was apparent. Jim and I were doing constant media on Sydney radio, as well as interviews for TV and print media. Our own media consultants, Mountain Media, were also preparing for the most concerted and organised media event in the FBEU’s history. As FBEU members (predominantly off duty) started to descend at the FBEU office, the stage was set for an uncharacteristically public Union meeting. At the same time, satellite meetings wee commencing at Newcastle and Wollongong. All the while, and to the knowledge of very few, Jim and I were still strategising around the final decisions on how we would play this out should the meeting endorse our recommendation for a general strike. It was a very fast moving issue and we had a lot to consider as the three meetings started and progressed. Pivotal to the way this day would play out was our fire communications centres (triple zero fire radio rooms). Whenever we’ve taken industrial action in the last fifty plus years, we’ve only ever taken limited type action where the comms centres stay online, and only some of our trucks and members go on strike. Not this time. This was a general strike. We were pulling the entire on duty fire force in the metropolitan area on strike including the three 000 radio rooms (Sydney, Wollongong, Newcastle) – we weren’t mucking around. This put enormous pressure on our members in those comms centres. There was the fact that they were the ones who took fire calls and referred them, there was the very real risk this created for the community, and the conspiracy spectre of recent and constant threats from the Govt to replace the comms centre staff (all experienced firefighters) with civilian staff. This fed concerns that if they were shown to be dispensable, this risk would increase. Our position was that if we gave into that fear every time we had to defend ourselves, none of us would ever take industrial action. This was an end game threat to us, each and every one of us. What good are we to the community if we aren’t protected while risking our lives for them? I returned a call to our delegate in Sydney comms early on that morning. Explained to him what was going on, and how important it was that they stood firm on the strike. He understood, and committed to conveying that to all our members. He did a great job. Just prior to the general meeting, I had a call back from him. The Duty Commander (Inspector) in the comms room had circulated an email and verbal warning to all comms staff that they were to ignore the Union instruction, and remain on duty. I had concerns that if we lost the comms staff, others would follow. It was important that we had as many hold the line as possible. I rang the Duty Commander directly, explained his role as a fellow Union member this day and the fact that I was furious that he would put that pressure on his staff. I instructed him, as a Union member, to observe the instruction himself, and to leave our other members alone. I rang the delegate back, gave him some assurances around legal concerns, and to settle the members there. He did, and we kept the Comms centre 99% solid out on strike. And so began the next phase in this story. Three large groups of off duty firefighters in three major cities supported by local on duty firefighters and fire trucks, surrounded by an ever increasing media pack while being watched by thousands across the state. The Sydney meeting ran fairly smoothly, even with a frank and open debate by members on the risk of this recommendation and the seriousness of the proposed action. Some solid democratic debate was had, but nonetheless, the recommendations were voted on and overwhelmingly supported. The Newcastle meeting went much the same way, however the Newcastle and Wollongong State Committee reps faced some difficulties at their meetings. Without the State Executive there to face concerns and give detailed background information about the proposed action, including legal questions of liability etc, the discussion became somewhat more difficult to settle and to express the State Committee’s firm position that this was a last resort, that it was the final action we could take and our absolute requirement to prosecute our case this way. This was especially apparent in Wollongong where a couple of local members dominated debate without this crucial knowledge, resulting in a ‘no’ vote in Wollongong. Nonetheless, overall and statewide, an overwhelming majority across the three meetings supported our recommendation endorsing the proposed action. A democratic decision had been reached for the general strike of a generation. Adding to the theatre and real time strategy of the event, and unbeknown to the Newcastle and Wollongong meetings, David Shoebridge MP (Greens) spoke to the Sydney meeting just prior to the vote, explaining the finality of the day to come in Parliament, his intention to move a amendment from the floor of Parliament to protect firefighters (and NSW Ambulance officers), and the need for a united and public show of strength from the FBEU to assist that into the Parliament later that evening. David Shoebridge MP was well received by the Sydney meeting, and he later became one of the heroes of the day. With the membership meeting results in, most of the FBEU committee headed up to Parliament House with the members from the office meeting. With flags and banners they formed the first wave of FBEU members to proudly march on NSW Parliament that day. Once there they began the operation and assisted the organisation of what would end up being, to the best of my knowledge, the largest gathering of fire appliances into one location in Australia’s history. The FBEU Vice Presidents spoke to the rally as it gathered, and Unions NSW had a contingent there as well. Jim and I stayed at the office for a while, running an unbelievable amount of media about the result and preparing what we call a ‘Code Red’ notice (industrial action) to be issued to members via a fax to every fire station and section in the state. All on duty firefighters in the metro areas (Sydney, Newcastle, Wolongong) would take immediate strike action and report to the three nominated rally points. Newcastle and Wollongong (trucks and members) were to report to central locations to be addressed by the FBEU officials at those locations, while the entire Sydney FRNSW firefighting fleet were instructed to make their way to Macquarie St Sydney, right in front of Parliament House. To the Wollongong firefighters credit, even though they have voted against the action locally, they supported the democratic outcome and followed the Union’s historical instruction. Newcastle never wavered, and responded to the instruction immediately. 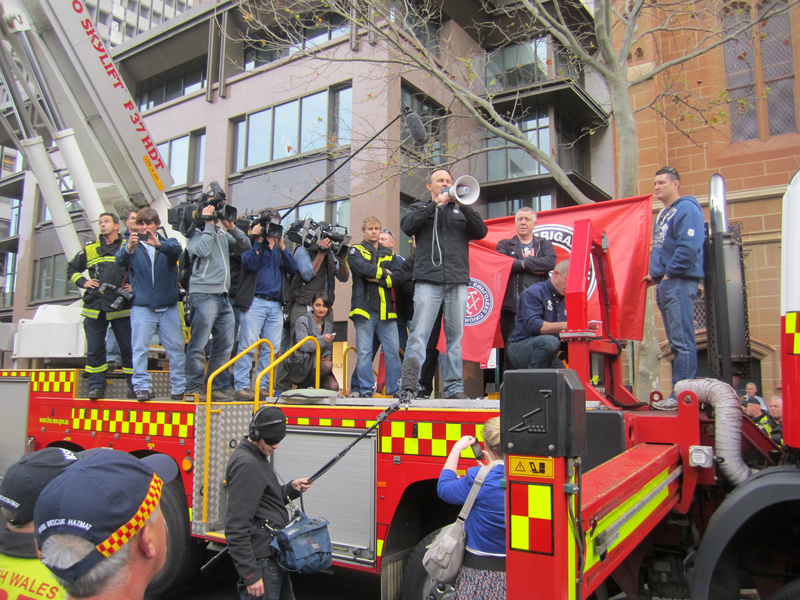 Sydney continued to gather momentum with the large numbers of trucks and firefighters reporting to Macquarie St. This brought absolute chaos to that part of the city. As Jim and I arrived at Parliament, even we were in awe of what was transpiring. Truck after truck, fire crew after fire crew, were rolling into the city rally point like a battalion of tanks. The infantry had already come straight from the office meeting, and more were piling in. The RFS volunteer fire crews (many of whom, due to their support of our cause and were torn at being asked) had reportedly started moving into parts of the metro area to stand by, and a handful of strike breakers and scabs manned appliances which were used to little effect across Sydney. Aviation firefighters (different union and different organisation) were also used at some calls during the day, and I found out later that they were fully supportive of what we were doing and almost joined us at one point. Note: At no point did the FBEU try to stop any other contingency put in place by the government to provide fire protection. This was not about putting people at risk, it was about withdrawing our own labour, labour that this Government took for granted. We were very clear that once we withdrew our labour, that we were no longer responsible for urban fire protection in metropolitan NSW. The Government was responsible for that, and they were given ample time to provide whatever contingency was required to fulfil their responsibility. I believe they failed to do that. 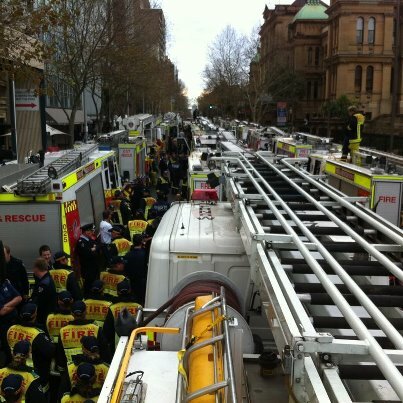 And so we rallied, what looked like hundreds of fire trucks and thousands of firefighters, converging on NSW Parliament. I’ve been a firefighter for almost 25 years and I’ve been to many major disasters and fire incidents all over NSW in that time. I’ve seen the FRNSW State Fire Training College packed with fire trucks and firefighters during the 1994 bushfire disaster that engulfed Sydney and NSW, as well as the hail storms that required similar emergency gathering and response. I’ve been to factory fires and city high rise fires, and never before had I seen so many fire trucks and on duty firefighters all in one place, let alone with the off duty firefighters there too. Seriously, it was an amazing sight. The fire brigade employs dozens, if not hundreds, of fire senior officers to co-ordinate such numbers and resources at fire incidents. We managed the whole thing with fourteen FBEU officials, our delegates, and our industrial/office staff. So we pulled together the largest gathering of fire vehicles and firefighters possibly ever seen in this country into one point in the middle of the Sydney CBD, and called a meeting in front of the passing public (who too were amazed at the spectacle), the NSW Parliament (with MP’s in the front balcony) and the media. As we prepared to speak to the assembling FBEU members, Jim and I called the State Committee together for a brief meeting by a telephone box on a park bench opposite Parliament. We made a final decision on a motion to put to the meeting, with Jim scrawling it together on a scrap piece of paper leaning on that telephone booth. It was at that point, as I remember it, that one of our officials suggested a stunt. He suggested we hook a hydrant and hose up somewhere, making reference to the stunt I’d pulled with other FBEU members at Win stadium at Wollongong the day we took on Micheal Costa in 2008. That day we used a large ladder truck (called a ‘Bronto’) to hose down the stadium as the NSW ALP Treasurer left, after we had just had a rally and a run in with him over wages. That’s a whole other story, but the idea got immediate traction. I suggested we use a ‘Bronto’ to do the same thing we did in Wollongng, and as a group we planned how and when to do it. Jim was (rightly) immediately concerned about the legal ramifications, but one look around at his officials showed there was no going back, and Jim was never one to back down from a fight. He was with us, and it was agreed to proceed with the stunt. 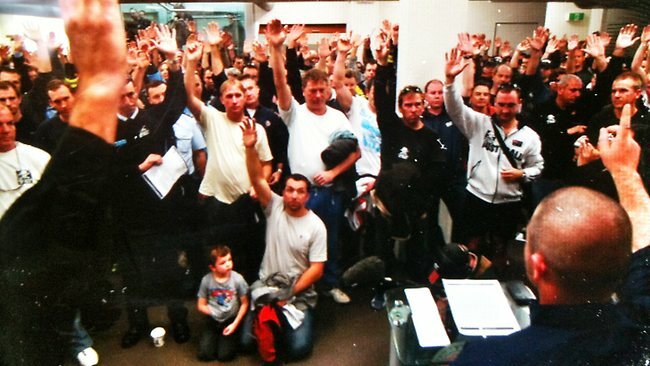 Earlier that day, FRNSW management had ‘listed’ (booked a hearing) in court (IRC) over the proposed strike. This meant we had to commit two or three of our industrial staff to that hearing, which ended up going all day. Initially the hearing was intended to force us to stop our action, but it took an interesting twist. The commission ruled that it may only rule on industrial matters and Award issues. It considered that this action was political in nature, therefore possibly outside its jurisdiction. It was then resolved to consider an interim Award to dictate what strike action we could take for the next three months, specifically around what appliances we could and couldn’t take out on strike. That meant the ‘full bench’ had to be recalled which took some hours. This gave us time and space to run our action before the court made a ruling. This did, however, have an impact on what we did later that night. We were more restricted than we let on to the media, and had to play that out carefully. We convened the rally/meeting via loud haler right at the entrance to Parliament. We used the flat bed top of one of those large ladder ‘cherry picker’ trucks (‘Bronto’) which was perfect as a platform. I was joined by Jim and our State Committee on top, along with some media and cameras. The flags and banners were put in place and I briefly addressed the crowd of one thousand firefighters – every one of them an FBEU member. I then introduced the FBEU State Secretary, Jim Casey, and he spoke to them at length about how we got there, why we were striking, and what we wanted to achieve. We then put the motion (that we had just minutes earlier scrawled onto a bit of paper at that telephone booth and park bench) to the meeting, which effectively said that the meeting endorses the State Secretary to take further, ongoing, and sustained general strike action if need be. This was important. It meant we could promote the strike action as not just a ‘flash in the pan’ few hours, but rather action that would be considered on-going. We needed to telegraph the perception that the FBEU elected officials were mad enough to stay on strike, and that we had the backing of every firefighter in NSW. We know that this message was conveyed to the Parliament and that it played a role in the outcome of the legislation. Media reported it that way across NSW that night, perpetuating a state of possible on-going chaos. As we rallied outside the NSW Parliament, ‘question time’ had started inside with NSW MPs discussing the strike before the legislation was to be debated later that evening. The NSW opposition leader, John Robertson, attacked the Premier for the cuts to workers compensation and defended the moves of the FBEU that was occurring that very minute on the street outside. The Premier responded by ignoring the obvious division and chaos his legislation was creating, and attacked the FBEU stating that the fire strike action was, “the most reckless action by a public sector trade union he had ever seen”. However, and as Jim and I had made very clear to the public and the media that day, it was through his actions and his reckless treatment of the people he employs to protect the community, that we were forced to take this action. It’s on that basis that he became the first NSW Premier, and indeed the first Australian Premier in living memory, to lose complete control of the fire service on his watch. Quite a record. As the Premier tried to justify his loss of control of NSW emergency services to the Parliament, we were completing our speeches outside – but we weren’t finished yet. Just before the speeches started, I asked one of our members, Garth Boyes, who was one of the two drivers on the ‘Bronto’ we were using for the speeches, to set up the water monitor at the top of the ladder that the fire truck operates, so that when I gave the signal (which in traditional firefighter terminology is ‘water on’) we could hose down Parliament. I explained to him that it came with some legal risk, and that if he was uncomfortable with the suggestion that I could and would do it. I’d never met this man before, and without hesitation he turned to me and said, “Sully, I don’t care what they do to me, I’ll do whatever you want me to do, just say the word.” We shook on it, and once again the gravity of the moment was clear. In a final address to the rally, being videoed from high rise buildings across the city and at street level, with the media watching on, I explained to the exuberant throng of disgruntled firefighters (and by now a very supportive crowd of city workers and civilians), that a smell was emanating from Parliament, and that as a final message to the NSW Premier and his Ministers, the “foul stench of hypocrisy emanating from the Parliament must be washed away” – and with that, through the FBEU labelled loud hailer that had worked so hard that day, I shouted, “water on”. Without prompting, hundreds of firefighters started chanting, “water on, water on, water on”. Comrade Boyes immediately raised one of the largest firefighting monitors in existence, up into the air, high over the roof of Parliament, and promptly began drenching the very roof that housed the Ministers debating our futures inside. The public cheered, the firefighters chanted “shame Barry, shame”, and bystanders chuckled. You can imagine the difficulty this created for NSW Police. On the one hand, they had senior officers present who had been directed by the Emergency Services Minister to keep the peace, and stop anything illegal happening. The truth is, pretty much everything we were about to do could be deemed as illegal, but the Police could relate to our frustration (even though they were exempt from the legislation) and we work hand in hand with each other on a daily basis anyway. The Police Association and FBEU in NSW have been close during our tenure, and that paid off on this important day. For example, at the start of the rally, a zealous police officer started stopping the fire trucks from getting to the point on Macquarie St that we wanted to get to, and an FBEU official came to get me. I had a frank and open discussion with the police officer, which in all honesty I was prepared to escalate if need be (easy to say with a hundred firies behind you ready to rumble). But sanity prevailed, and a wiser more experienced officer let us through. During the speeches, word got around that we were setting up to wet Parliament, and it was a rather stressed senior police officer that warned us not to spray Parliament immediately before we did just that. He seemed quite upset as he circled the Bronto surrounded by one thousand fireys. Just after the speeches, after the Parliament was hosed, and as the water monitor was being replaced, someone came up the steps of the Bronto and warned me that the police were coming for Garth. As I looked down, I could see the senior officer, flanked by a few general duties police circling the Bronto, and they were on a mission. I quickly grabbed Garth (who was still putting the finishing touches the housing of the water monitor) and said, “the cops are coming for you, don’t talk, come with me.” With that, we both scurried off the back of the Bronto while the police were coming up onto the top of the truck for us. Other firies blocked both exits off the truck, and Garth and I escaped. Like an old silent cop movie we all did laps of the fire truck, and they caught up with us and started to question Garth. The senior officer asked him his name, and told him he had to comply. Garth looked at me, and I told him he shouldn’t respond until we got advice. Garth repeated this to the officer, and the officer went red. Surrounded now by firefighters and police on all sides, we were squarely the centre of attention. Again the officer asked for details. Again, I warned him not to respond yet, and again Garth repeated that to the officer. The officer was in the process of telling me where to go, when he turned to take a telephone call on his mobile. To this day I’m pretty sure it was a police Association official, who Jim had called to sort out the predicament. Not waiting to find that out, I then grabbed Garth and we slinked off. As we moved through the crowd (and it was shoulder to shoulder crowded by yellow and black fire jackets) I realised those of us who were officials stood out – we were the only ones who had no fire jacket and were wearing black FBEU collared shirts. While ever Garth was with me, he could be identified, so I rushed Garth to a group of firies, and said, “quick, hide him for me”. They huddled around him as I left, and he became a needle in a haystack. Weeks later, Fire and Rescue NSW tried to charge home with code of conduct offences, and threatened police charges. We represented him on the matter and considered pulling the entire workforce out again, however, as part of getting the charges dropped, and some discussion coming from the original IRC strike case, we made some assurances around industrial action in the future. 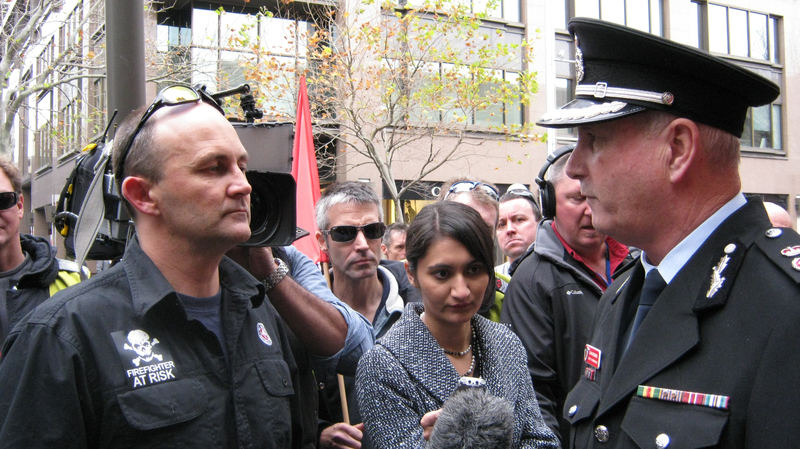 The Fire Commissioner, Greg Mullins, was overseas on June 21 2012, so the honour of dealing with the largest firefighter strike in a generation was left to Deputy Commissioner John Benson. Just after the protest rally and Parliament wash down, I noticed the Acting Commissioner leaving the steps of Parliament House. He was walking South toward his office on the city. I looked for Jim, and couldn’t see him, so in a reflex decision I hurried across the street toward the Acting Commissioner. I passed one FBEU member and said, “I’ve got the Commissioner, get Jim, quickly”. I rushed toward John Benson (who now realised something was up and was walking quite fast), and the media saw that something was up. Before I knew it, I was chasing the Commissioner and the media were chasing me. I yelled out to him and he winced as he looked around and saw me with the media in tow. To his credit he stopped and we spoke. Surrounded by media, and with no clue what it was I wanted to ask him or achieve, I started asking him if he had spoken to the Premier, and whether he had conveyed our collective frustrations. As he answered, I saw Jim behind the media pack. That firey acted quickly alright. I announced the State Secretary’s attendance for the media and invited Jim to speak – and speak he did. In the middle of such serious strike action, on the street in front of Parliament, and in front of the striking firefighters, we were able to force an impromptu press conference with the Acting Commissioner who had just met with the Minister for Emergency Services. It was another piece of theatre that added to the historical day. Like a prize fight where one of the fighters just didn’t want to be in the ring any more, we let Acting Commissioner Benson go, and we returned to the main attraction. It was worth the chase. During the peak of the strike a fire broke out in a home in Ramsgate, south east of the city near Kogarah. Jim and I started to get calls immediately from members, and eventually the crew who attended called us directly. This was to be a defining moment for the strike action. Putting aside the obvious care we have for those we protect, and us not wanting anything bad to happen to anyone, strategically there were two sides to an incident occurring. On the one hand it was a risk to us and what we were trying to achieve. On the other hand, we had been telling the media and the public that the community were at risk by the strike action, especially if the Govt didn’t put other measures into place. That was pivotal to whole argument. An incident happening was always going to be the best and worst thing for our cause. As far as fires go, and as distressing and sad as it was for the family involved (no injuries occurred), this was the one to have. Not because of the fire and property itself, but because it exposed how important full time fire stations are in society. This fire, in my opinion, showed exactly why a professional fire service is so important, and why pushing emergency services to these limits is bad public policy. The Rural Fire Service (RFS) responded and did their very best, as did the Aviation firefighters (AFRS). Their response was not as rapid as ours would be, but they got there. Luckily, the local (FRNSW) truck and crew were en route to the strike rally when the fire broke out. They saw the smoke, heard the radio calls, and self responded. Despite inaccurate reporting from local residents and the media, they were there quickly, knocked the fire down, rendered the property safe, and handed over to the RFS and AFRS before heading into the rally. This is fact. I saw the official logs. Further, the FRNSW Acting Commissioner confirmed the same response data we released that day as well. Nonetheless, the media ran a negative line on the fire, which was to be expected. An attempt was made to sensationalise the incident, which played right into the hysteria we required for impact. If the strike wasn’t already going to be the lead story on all news channels that night, it certainly was now. Hours had passed. For the time being we’d achieved what we wanted to achieve, and we now had the task of organising every fire truck in the greater Sydney Area to get back to their stations. Only problem was, the traffic lights were in normal mode. They would go green for a matter of seconds, only allowing a handful of trucks to leave at a time. So lined up the entire length of Macquarie Street were a hundred fire trucks. We asked the trucks to ring their air horns and sirens as they left. What we didn’t expect was every single one of them operating both for over half an hour. Imagine one hundred fire trucks, all with sirens going, blasting their air horns, non-stop for over thirty minutes. It was deafening, and it was a sight to see (and hear). Our off-duty firefighters who attended, joined by the public and indeed some of the ALP and Greens Party Ministers, lined the street clapping and cheering the firefighters as they waited for the lights to change with sirens blasting. We stood there too, clapping, thanking each crew for attending. This was their moment. Their unity and collective strength had created history, more than we realised at the time. As fire crews from all over Sydney returned to their bases, they gradually all went back ‘online’. The city slowly emptied, and my State Committee comrades and I slowly made our way back to the FBEU bunker. The sense of chaos settled somewhat, but we weren’t done yet. We immediately reconvened a State committee of Management meeting to debrief the day, and issue a notice to stations. We were also briefed on the final outcomes from the Commission by our industrial staff, and the media was still running hot – especially over the Ramsgate fire. Parliament was still sitting and yet to debate the legislation. As far as they knew, the fireys were back on duty, but considering doing the same action again the next day (perhaps in defiance of the court order and interim Award that came out of the IRC that day). Jim and I finished our last media interviews about 7pm. My final interview was with 2GB, during which the shock jock was particularly hostile, hysterical, and nasty. The broadcaster was trying to sensationalise the Ramsgate fire, and didn’t like facts being used. When I launched into a strong run against his points and the the Government’s decisions, he accused me and other firefighters of threatening to bomb his radio station. Seriously, those clowns have no moral radar. Nonetheless, most of the other media we did was balanced and went quite well. When the work was completed at the office we headed for a beer. It was much needed downtime after such an intense day, with such public pressure and highs and lows. It had gone so fast that we found it hard to know exactly how we fared and what we achieved. At that point, we were so jaded that we had all but assumed that the legislation would go through, supported by the usual cross bencher suspects. With my two hour drive home ahead, I made way from the city. Arriving home late, and unable to share the amazing things that transpired that day with my family, I crashed back to normality. The next morning I awoke to start getting my family ready for school and work. I gingerly turned my phone on, a little scared that it might be worn out from the day before. It immediately started beeping for messages, texts, and missed calls – dozens of them. Something had happened, that was clear. I noticed some of the texts were congratulatory, but I still thought they were just reflections on the organisation of the previous day. Still, something wasn’t right, so I rang Jim. “We won”, he said without saying hello. “What?” I replied. “We won Comrade. David Shoebridge and the Greens got the amendments through Parliament at 2am this morning, exempting firefighters and paramedics!”, he exclaimed. I won’t repeat the next words I said, but let’s just say I had to apologise afterwards to my girls eating breakfast listening to the call. We had done it. We had changed the political landscape in 24hrs. We had held onto the protections we believed we needed to do our job, and we did what no other Union could. We’d fought our first major battle with the wolves, and won. Through collective solidarity, we held the line. To this very day, when a firefighter in NSW is injured on the job, he or she has better protection than they would have had should this conservative government had its way. We were always in it for all workers, and we’ve always said that we continue to be there for other workers who deserve the same workers comp protection, but when push came to shove, my Union, my workmates, said, “no more’. My advice to other workers – withdraw your labour until you are no longer taken for granted by fat cats and wolves in the top end of town. ‘A little rebellion now and then is a good thing’. Stay united.